And while Butler has come around offensively, it’s his efforts on the other end of the floor which has his competitors taking notice. 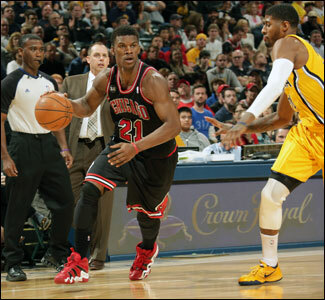 “He’s a great defender,” acknowledged Indiana’s Paul George on Monday morning. “He’s good with his feet, he’s good with his hands. He knows team defense as well as being a great on ball defender. As an elite defender in the league, he’s one of the top ones. Butler and George met just four days ago in Indiana when the Pacers recorded a 91-79 victory to take a 2-1 edge in the season series. Though George finished with his second career triple-double of 10 points, 12 rebounds and 10 assists, he shot just 3-of-13 from the field with Butler defending him the majority of his minutes. Thibodeau said he likes the way Butler has played all year, calling him a “huge part of our team.” But as he pointed out, one of the most challenging parts of Butler’s role comes on the defensive end, where he is often tasked with slowing down the opponent’s star player. While Butler helping contain George will be one point of emphasis, the Bulls know they will also have to rebound in order to defeat the Pacers. In their last meeting, Indiana outrebounded Chicago 51-36, a fact that is not lost on Bulls center Joakim Noah. “We’re playing against a very physical team,” said Noah. “A lot of talent, one of the best teams in the league right now. They’re in our division and they’re in our way. It’s going to be an exciting game. We’ve just got to find a way, whether it’s rebounding, I don’t care, we just have to find a way. With a victory, Indiana will clinch the Central Division title. But Pacers coach Frank Vogel knows that won’t come easy. “It’s always tough to get a win here, especially when the division is on the line,” said Vogel. “I’m very, very impressed with how hard they play in particular in this building and how hard Coach Thibs gets these guys playing. We’ll have to match their energy and execution.